One of the best high-end prebuilt gaming PCs available at an incredible price. An extremely powerful PC at a shockingly low price, with a beautiful case, attractive lighting, and some great options for upgradeability. Despite being founded back in 1999 in California, iBuyPower was something of an unknown commodity for me before receiving one of their RDY machines for review. A little research reveals a company that's long been focused on marketing prebuilt machines to gamers and enthusiasts, both through traditional advertising and through partnerships with eSports teams, component manufacturers, and game developers. The RDY ELIBG205 feels like the natural evolution of that legacy, a high-end machine that's aimed at gamers and priced to appeal to the PC elite who might be accustomed to building machines themselves. It's one of the best gaming PCs, a prebuilt focused on some key top-shelf performance components that trims fat where appropriate to deliver a plug-and-play rig that easily rivals a DIY machine but, almost unbelievably, actually costs less. The iBuyPower store page for the ELIBG205 lists the DIY price at $2893.37 and that's fairly close to a similar machine I constructed at PC Part Picker (the Part Picker machine came in just over $2700 but also lacked some proprietary parts and, of course, the ELIBG205's three year warranty). The price of the RDY, meanwhile, is only $2599. The RDY's chassis is a pretty standard size mid-tower case, replete with pulsing RGB lighting and with an understated logo on the bottom of the tempered glass front panel. The left panel is another gorgeous pane of tempered glass held in place by four thumb screws, and grating on the top aluminum panel reveals a ventilation fan ringed in RGB light. 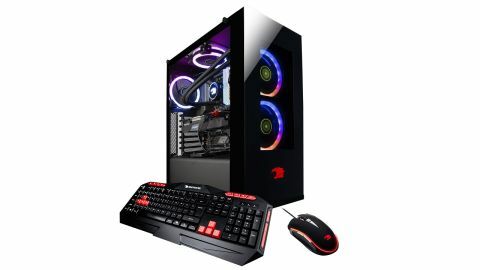 It's a really attractive machine, with the rainbow of colored light playing well across sleek black and glass and the gunmetal of the MSI motherboard. The XPG Spectrix RAM also slots into the aesthetic well, in stark white with its own bars of blazing RGB. In a dimly lit room the RDY looks like a futuristic cube aglow with a broad spectrum of throbbing, hypnotic light. Accessing the case interior is completely tooless. Popping off the four thumb screws on the tempered glass panel lets you remove it and get at the motherboard, while removing a pair of captive screws on the back of the aluminum right panel lets you slide it off to get at the HDD bay, PSU, and cables. It's incredibly easy to get into the machine and start tinkering, and the ELIBG205 leaves you a lot of overhead for upgrading its already formidable setup. There are three Gen 3 PCIe x16 slots and a pair of PCIe x1s, as well as space on the board for up to 64GB of RAM, two M.2 SSDs, and five additional SATA drives to go with the limited 1TB 2.5" SATA SSD that comes included. Given how hungry modern AAA games are for storage you'll probably want to add additional drives at some point, so the added SATA and M.2 slots are welcome. My only minor quibble here is the size of the HDD bay, which is empty of trays of any kind. The bay is only large enough to accommodate two drives which need to then be screwed into place, and while two additional drives will likely be plenty for most users, it feels limiting paired with a board that support a total of six SATA devices. The RDY ELIBG205 is stacked with powerful components ready to handle games at 4K Ultra. Most games will run comfortably around 60 FPS at the highest settings on this Core i9-9900K, 2080 Ti equipped beast, and even the ultra-demanding Metro Exodus stayed comfortably above 30 FPS at 4K Extreme with ray tracing at Ultra. The RDY also crushed 3D Mark benches, clocking in at 16,257 at Extreme (1440p) and 8,434 Ultra (4K). Compare these numbers to the Corsair Vengeance 5180, which costs only $200 less and returned scores of 12,515 for Extreme and 6,522 for Ultra. I've spent about 20 hours bopping around post-apocalyptic DC in Ubisoft's massive open world shooter, The Division 2, and the RDY has delivered consistently silky 50+ FPS frame rates throughout. The RDY is the only prebuilt I've tested that's realistically capable of delivering a consistent 4K Ultra experience at anything approaching 60 FPS. Contrast this with Alienware's Aurora R8, which retails for $2,774.99 and is down near the 30 FPS mark in the same games. The powerful, overclockable 9th Gen processor also means the RDY delivers great productivity performance to match its gaming chops. The RDY comes packaged with a keyboard and mouse from iBuyPower, and while neither is a top of the line peripheral, the keyboard especially is suitable enough to tide you over until you're ready to upgrade to the best gaming keyboard and best gaming mouse. It's also built around an excellent Gold Plus rated 650W PSU that's fully modular, so you aren't stuck with a bunch of additional power cables that you'll never use that just serve to clog up the case and get in the way when you decide to upgrade or add components. And the machine is festooned with USB ports, with a pair on the front and another six on the back of the rig. The RDY ELIBG205 is the best prebuilt I've had the pleasure of testing for review, delivering not just incredible power but excellent value. Any manufacturer so inclined can build a machine around high-end parts that performs well at 4K Ultra, but it's incredibly rare to see them at anywhere near an affordable MSRP, much less at less than the cost to build it on your own. Even beyond the raw power and the attractive price tag, the ELIBG205 delivers some great features and a high ceiling for future proofing, all under the aegis of a three year warranty.